A $15 kit will recycle your used Tyvek -- which brings up the question: Why are we using Tyvek to begin with? May 7, 2009, 12:43 a.m. Despite its ubiquity, many people don’t know what Tyvek is. You probably most often see Tyvek when mailing or FedExing a package — or sending back your Netflix DVD. Tyvek’s that extra-strong paper-like material used in everything from one-use envelopes to ready-wear clothing. 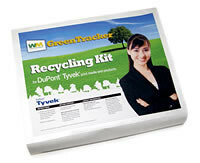 Tyvek’s made by Dupont, which often brags about its nationwide recycling program for the 100 percent recyclable Tyvek. But while Dupont’s “Tyvek and the Environment” page makes Tyvek sound like an eco-friendly material, the reality is that Tyvek can only be recycled if YOU individually collect Tyvek envelopes and YOU pay to mail them to Dupont for not recycling, but downcycling. That’s work and expense that only the very eco-minded are willing to expend — yet many people who don’t realize that the little recycling triangle on Tyvek envelopes doesn’t actually mean that those envelopes will be recycled by their municipal programs will assume Tyvek’s pretty eco-friendly. Those people keep using Tyvek envelopes — the vast majority of which don’t even get downcycled but instead head straight to our landfills. That’s why the $15 Tyvek recycling kit from Waste Management is telling — because it points to the fact that Tyvek recycling is neither easy nor cheap! Aimed at businesses and government agencies, the recycling kit’s basically a big 12” x 16” x 4”envelope that you can stuff full of Tyvek to mail to Dupont. Isn’t it easier to just — not use Tyvek and stick to materials that are either reusable or easily recyclable through existing local programs? That way, businesses and government agencies could save money by NOT buying the recycling kits, lower carbon emissions by NOT shipping heavy bags of Tyvek around the country, and prevent downcycling by NOT using one-use products. Since a biz or agency that would buy the recycling kit to begin with is ostensibly one that cares about the environment, it seems like just avoiding the need to buy the kit in the first place would be an eco no-brainer…. To be clear — I’m not necessarily against Tyvek when it’s made into a reusable product — like those Netflix sleeves. I’m just against the one-use stuff which, just like plastic bags in grocery stores, I see very little use for and a lot of negative enviro-consequences from. For now, when I get packages sent to me in Tyvek envelopes, I flip them inside out and reuse it to mail something else — so that the practically indestructable envelope gets at least two uses. How do you deal with Tyvek?